On our hike from River Trail to Stout Grove (Jedediah Smith Redwoods). So you are trying to simply walk out of the door and make it to the car with your kid. It's just a morning outing and somehow you're holding TWO different bags and a juice cup as you stuff a stray extra diaper in the backpack shaped like a (insert: fox, owl, ladybug, giraffe, monkey, etc.) with your non-phone/juice holding hand and grab your keys - whoops! dropped the phone!... [insert crazy-face emoji here]... If that description sounded very normal to you, then the title of this post probably sounds hilarious. It's hard to imagine EVER packing all you could need for an entire trip with a kiddo in one or two bags, but I'm here to testify... you can! Obviously no destination is created equal, but this is how we tried to pack as smart and light *BUT AS PREPARED* as possible for our Oregon roadtrip. SkipHop backpacks always win. (Click image to see more from SkipHop -- *This is a commission affiliate link for recommending this product I love! 1. PACK TINY. 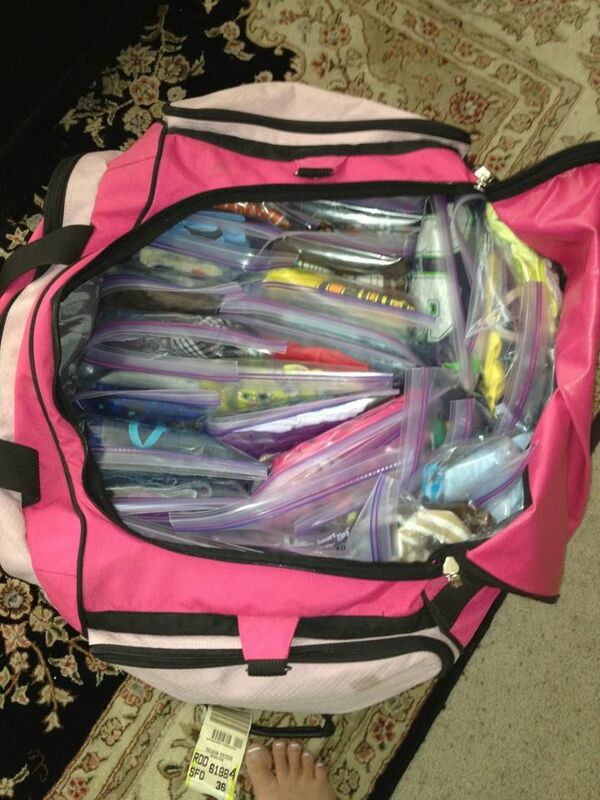 Ever since my first backpacking experience during my senior year in Romania when we were only allowed one backpack, I've become a supporter of the ziplock bag method (this mom packed 46 outfits for 5 children in ONE BAG, people!) . I know there are lots of "fold all your clothes into each other like origami " or "create one giant ball of clothes to have no wrinkles," but I've always preferred having outfits separated. Also, *bonus*... toddler clothes are still so tiny. After flattening all of the air out of a ziplock bag you're left with a pretty teensy thing to pack! 2. DESTINATION LAUNDRY. With the growing popularity of AirBnB, this element is becoming easier and easier... so for the love, stay somewhere with a washer and dryer! I read tips from a mama who packed for herself and two kids in one backpack for Europe, and she brought each of them just 2 or 3 shirts. I was so confused (because sometimes my kid goes through like 4 shirts in one day with his messes) and then I realized she was staying with friends along the way and could do laundry. For our Oregon trip, we were able to pack 2 days less worth of clothes, and for our Disney trip we cut the outfits we needed in half! Really, we could've packed a lot less clothes for Oregon, but I was trying to not have Rowan in the same shirt all the time... but hello... in a cold climate all you are doing is getting pictures in your same coat all day long, so who is going to know? Ditch the extra weight. Now, if you're going to a warm climate with no washer and dryer, I'm sorry you wasted your time reading this tip. ​Refer back to the ziplock bag method and cling to that for hope. Toddler travel is full of FUN even in all the small things along the way. But also try to plan like you're traveling with a drunk... expect hilarious moments suddenly followed by crying and have your snacks and napping spots ready! 3. PACK HALF YOUR NECESSITIES. What does that mean? Well, if you need 40 baby food pouches, only pack 20. If you need 50 diapers, pack 25... etc. Why? Because there will be stores, and you can at least manage one store trip half-way through. I'm not sure where in the world you would be traveling with a toddler that would not have stores, but I suppose if you're only going somewhere very remote and rural then this won't apply to you. Pack extra toilet paper! 4. SHOES > CLOTHES. My kid has a magical power of getting his shoes dirty, muddy, sandy, full of ocean water, dog poo, rocks, sticks, creatures... okay JK... but the boy needs extra shoes on deck at all times... and plastic sacks for the ones that get messy. With adults, we can be reasonable about the one pair of shoes we packed and keep them relatively clean, but a toddler does not know -- or even more so -- does not give a care. Shoes are also harder to find and replace on the go. Even some Target shoes are going to set you back $20, and then there may not be any you even like or want to buy! All of these reasons back up my logic that the importance of shoes is greater than clothes... bringing your kid 4 pairs of their tiny shoes isn't as unreasonable as YOU bringing 4 different pairs. 5. SNACKS + ENTERTAINMENT. Now I saved the most important one for last... the first bit of advice I got from my fellow mama friends was to never be low on snacks. When a plane is delayed on the runway along with those in-flight snacks, a one year old will never be reasonable or understanding that they are minutes away. In a little while we will work on patience... for now we are working on having a no-scream zone with a low chance of melt-downs. The travel-friendly entertainment we had the most success with included Indestructibles (so flat and lightweight), foam puzzle set to build into blocks (watch out with this if your kiddo still sticks small things in their mouth), Sandra Boynton interactive iPad books and headphones if they'll wear them, sheets from coloring books with stickers, and a tiny car or character toy. All of these options were very light weight and small while also being something we didn't care about losing along the way (besides the books and iPad obviously). The stickers provided Rowan plane entertainment for a WHILE -- even all those nonprofit return address labels I'll never use! Stickers on our cups, barf bags, tray tables, our foreheads... "Don't mind me with the 5 stickers on my head. My baby is perfectly silent and not screaming in your ear!" So, all of this fit into one flat plastic bag and was so easy to access on the plane or in the car. We had multiple car rides and four 3-hour plane rides in total... zero crying! So how did this translate into luggage? *Our carrier backpack took the place of a stroller and it also separated into two packs or merged into one. The last bonus packing tips I can think of would be packing the baby food in a bag or lunch box since it's easy to pull out at security (if it's in your carry-on). You might be saying "um, duh"... but I wasn't even thinking about the fact that they counted that as a liquid, so we had to get extra screening the first time through after I forgot to pull them out. Luckily I already had them separate, so it wasn't too crazy! Going through security is sooo crazy enough. ​Also, I had Rowan's blanket in the top of my backpack (2) that rolled out, so it was easy to immediately access on the plane. And finally, we had one baby food pouch on deck and an empty sippy cup ready to fill before or on the plane. Those liquids + nursing made for very easy take-offs and landings! 2 - The flattest, lightest travel books: Indestructibles! 3 - ALL THE SNACKS. 6 - iPad with Sandra Boynton books, Daniel Tiger apps, etc. 7 - Toys that are thin, lightweight, tub-friendly and cheap (if lost)! So schedule those flights during naptime, buy some earplanes for your pocket (just in case... Rowan didn't care about 'em. ), and get to the airport earlier than you usually do since something will go wrong with a toddler. Also, depending on which airline you are flying, you may need proof that your lap infant is under 2 years old (especially when they're near the cut off). We didn't need it flying American, but then we did need it flying Southwest. They let us use our doctor's office record, but having a copy of the birth certificate is ideal. If you forget and are really in a pinch, one airline employee told us we could show the Facebook post from the day Rowan was born with the date stamp. Thanks, social media! AND ONE MORE THING... we opted out of the "first flight" gift bags, because I was trying to pack light and we had 4 flights. How many was I supposed to bring? Just enough for the adjacent rows? And then I thought, "What if he does perfectly and I'm toting around 25 gift bags?" So I'm curious to know others' thoughts on that! So what other tips did I leave out? *I've added some new toddler-travel thoughts now that we've experienced our first INTERNATIONAL family trip! Happy Adventuring, Mamas and Papas! What is the brand and model of the backpack carrier (#4 on your luggage list)? Hi! It is a Kelty Kids TC 2.1 Transit Child Carrier Backpack! Not very transitional for a small child but great for baby or small toddler!